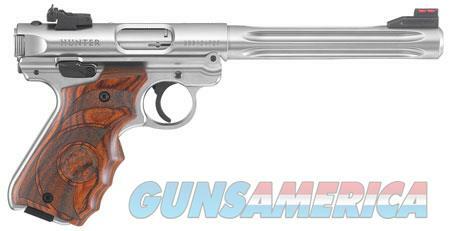 Ruger 40160 Mark IV Hunter Single 22 Long Rifle (LR) 6.88" 10+1 Laminate Wood Grip Stainless Steel Ruger's Mark IV features a simple, one-button takedown for quick and easy field-stripping and proper chamber to muzzle cleaning. The recessed button in the back of the frame allows the upper receiver to tilt up and off of the grip frame without the use of tools. Its internal cylindrical bolt construction ensures permanent sight to barrel alignment, while the contoured ejection port and easy-to-grasp bolt ears allow for durable and reliable operation. The accurate sighting system features a drilled and tapped receiver for Weaver- or Picatinny-style rail. The Mark IV is a single action and utilizes an ambidextrous manual safety, push-button magazine release located on the left side, and an ergonomic bolt stop. Included is a washer and two magazines. his Hunter model features a 6.8" fluted bull barrel, one-piece, precision CNC-machined stainless steel grip frame, stain stainless metal finish, target laminate grip, and a fiber optic front sight with an adjustable rear. SPECIFICATIONS: Mfg Item Num: 40160 Category: PISTOLS Type :Pistol Action :Single Caliber :22 Long Rifle (LR) Barrel Length :6.88" Capacity :10+1 Safety :Ambidextrous Grips :Laminate Wood Sight Configuration :Fiber Optic Front, Adjustable Rear Weight :44.2 oz Frame Finish :Stainless Frame Material :Stainless Steel Barrel Type :Fluted Bull Slide Description :Stainless Steel Case Type : Sight Style :Fiber Optic Barrel Length Range :6.00" to 6.99"